Join us this summer as we celebrate local talent and welcome some fabulous visiting bands. eat @ the park café will be open for refreshments and deckchairs will be available for your comfort. This is what summer Sundays were made for! 14th July: The Big Gig. 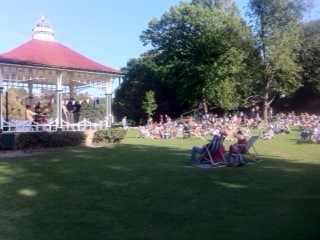 A whole day of events including Maidstone Wind Symphony 2-4pm, Smokestack Lightning 5pm, The Bleeding Hearts 6pm.